My classroom transformed when I started giving students art jobs for each class! You can use as much of the sign as you want to, just cut out the jobs you don’t want to incorporate into the sign. Art Jobs: In this example, every table is labeled with a 1-8 at the top of their area (you will need to print out several sets of the numbers-one set per table & one for your sign). I put a magnet on the back of each of the 1-8 numbers & rotate them every week. Jobs change each week so the student isn’t always doing the same job. **Backgrounds NOT INCLUDED (you print the templates, MOUNT ON COLORED PAPER or poster board, and laminate them). Art Jobs: In the 2 person example, every table is labeled with a 1 & 2 at the top (2 students are partners)-this is what I use in my classroom. You can use as many of the jobs as you’d like to-make sure to fit your classroom system. For my classroom, the 2 person numbering works best, but now I have added jobs to both of the numbers. Put a magnet on the back of each of the above numbers & rotate them every week (so the jobs alternate between partners). Jobs alternate each week so the student isn’t always doing the same job. Table Captain: Gets Supplies for you and your partner & puts artwork away at the end of class. Clean Up Monitor: Cleans up the table and puts away supplies at end of class. Template © Michelle C. East Create Art with ME 2016- For classroom use ONLY. NOT to be reproduced and sold for profit. IMPROVED 2016! 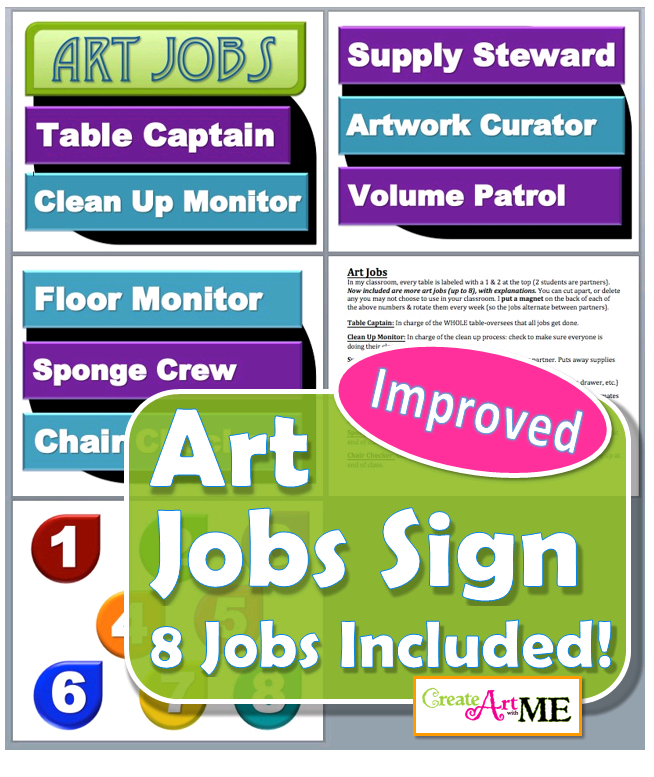 Now includes 8 art classroom jobs! 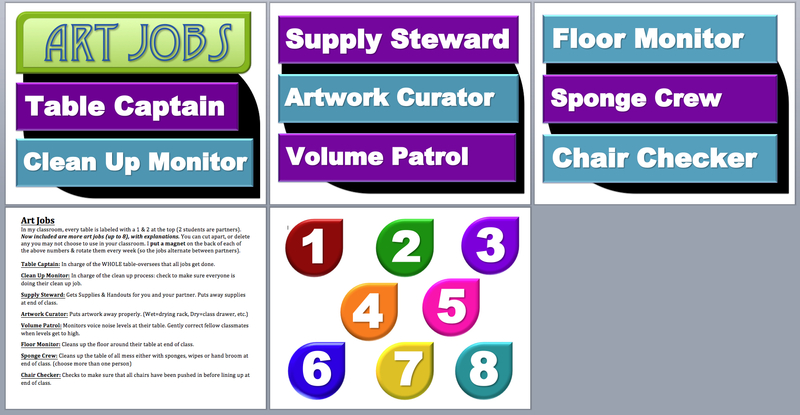 This is a printable sign for Art classroom jobs. I use this system in my classroom & it is very effective. This PDF includes the sign & the numbers. Use with as many #’s to fit your classroom layout & system. This sign coordinates with the Voice O Meter Template. Download it, Print it out, Cut it out, Laminate it & Use it consistently! **Backgrounds NOT INCLUDED (you print the templates, MOUNT ON COLORED PAPER or poster board, and laminate them).